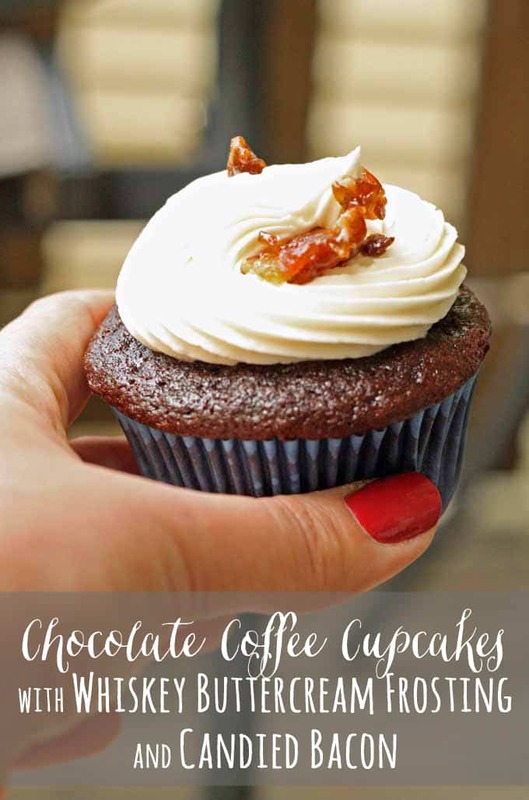 These chocolate coffee cupcakes with a whiskey buttercream frosting and candied bacon are perfect for Father’s day! This post contains some affiliate links for your convenience. Click here to read my full disclosure policy. Hamilton Beach provided me with a 6-Speed Soft Scrape hand mixer and a 6-Speed Stand Mixer to review and are sponsoring the mixer giveaway. 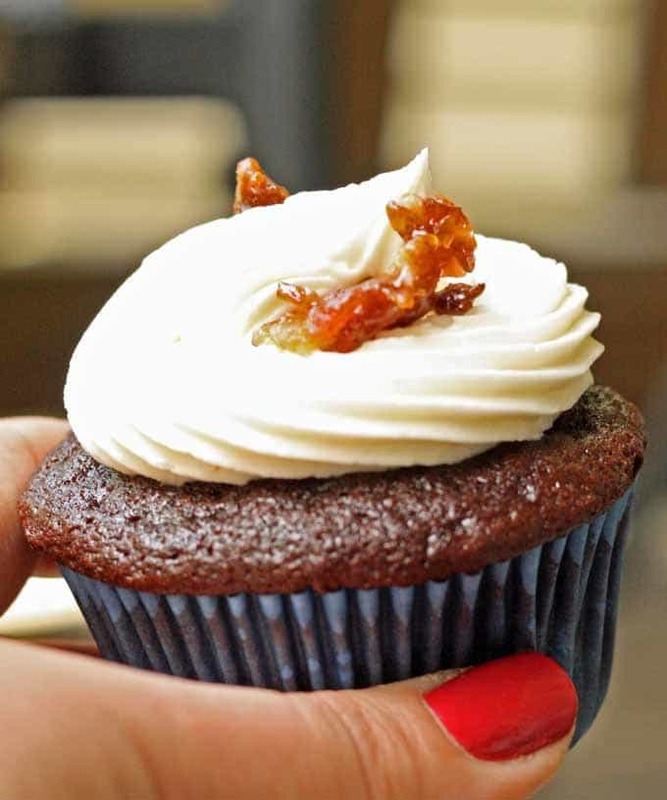 Hello cupcake, bacon and dad lovers! My dad is not the kind of guy to turn down a cupcake. Nor a piece of bacon. So I figured if I combined the two ingredients (with two more ingredients that should be consumed in moderation) then it would equal out to a handful of happy Father’s Day thoughts. 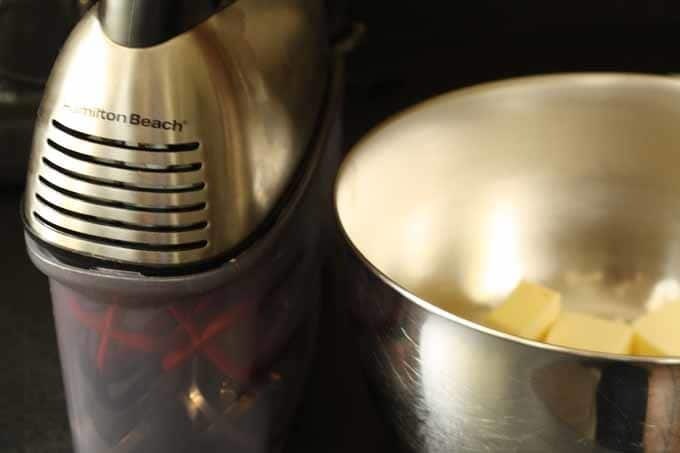 Lucky for me, Hamilton Beach sent over two handy new tools for me to try out – the 6-Speed Soft Scrape hand mixer and The 6-Speed Stand Mixer. And they are pretty freaking cool. I have been playing with them all month, trying out different recipes and I finally settled on this recipe for chocolate coffee cupcakes with whiskey buttercream frosting because it gives me a chance to show off both mixers (I used one to make the cupcakes and one to make the frosting). And the candied bacon on top is pretty awesome too! The 6 Speed Stand Mixer has the same mixing action as a similar popular stand mixer (you know which one I’m talking about!) It’s 300 watt motor is powerful! I probably should have made bread for this write-up just to show you how much power it has. That’s okay – perfectly mixed cupcakes will do just fine to introduce you to the product. 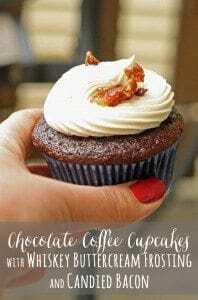 I found this pretty simple recipe for chocolate cupcakes on allrecipes.com and modified it to add the coffee. 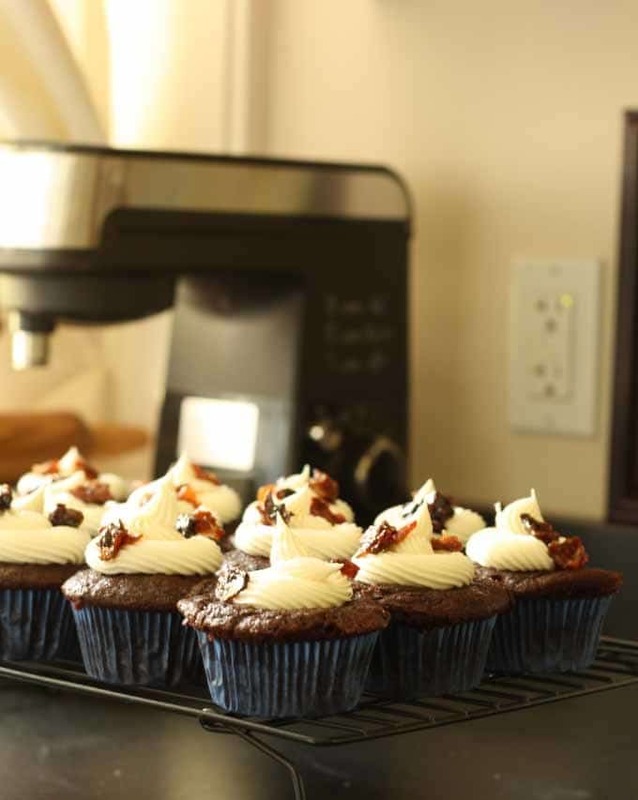 It’s a great recipe because the cupcakes are so incredibly moist. Really watch them at the end so you don’t overcook them because they are really what brings this whole recipe together. 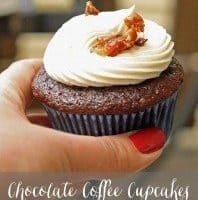 If you want to skip the whiskey and the bacon, plain frosting is great on these cupcakes too because they have so much flavor. And a slightly healthier cupcake isn’t a terrible thing either. Mr. B thinks both of these mixers look great on our counter – we’re big fans of the stainless steel look. I especially like how all the hand mixer pieces fit so nicely into the storage case (which snaps on!) for the Soft Scrape 6 Speed hand mixer. It’s hands down a great hand mixer. One of the things I like the most is that you don’t have to stop and scrape the bowl at all. It’s helped me make a few batches of mashed potatoes so far (in addition to this frosting.) See the red stuff in the picture above? Yeah, that scrapes the bowl for you without the risk of ruining the bowl. You could even mix right in your baking dish if you wanted to. 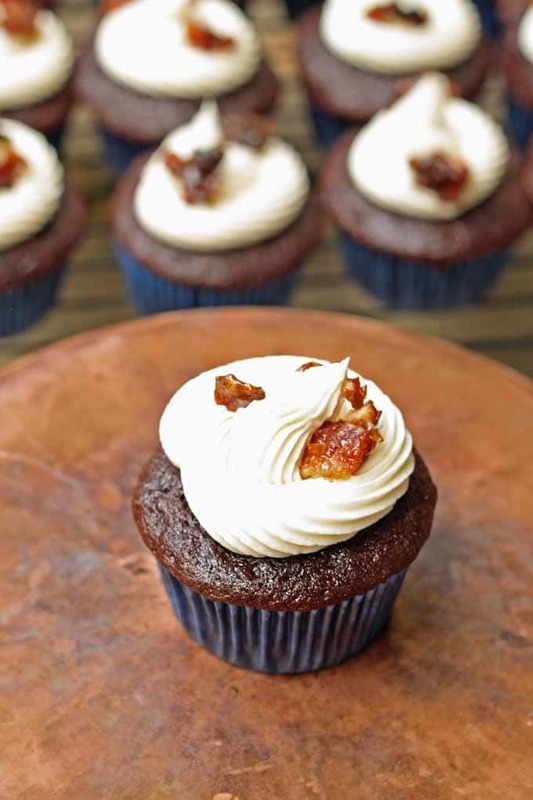 These chocolate coffee cupcakes are topped with whiskey buttercream frosting and candied bacon - perfect for a Father's Day treat. Preheat oven to 350 degrees F and line a muffin pan with cupcake liners. 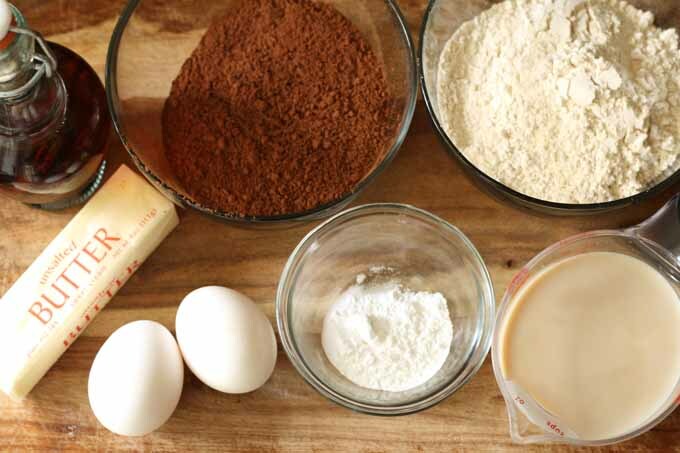 Combine the flour, baking powder, baking soda, cocoa powder and salt in a bowl. Sift all of the ingredients together. Using a stand mixer, cream together the butter and sugar. Add the eggs, one at a time until combined. Add the flour until well mixed. Pour the batter evenly into the cupcake liners. Fill each one to 3/4 full. Bake 15-17 minutes. Insert a toothpick into the center of the cupcake - if it comes out clean it is finished. Remove from oven and let cool 10 minutes in the pan. Finish cooling on a cooling rack. 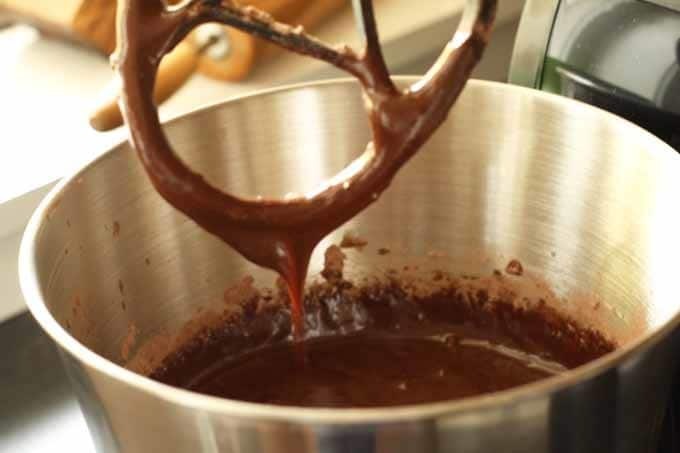 In a medium bowl, use an electric hand mixer to combine the sugar and butter. Slowly add the vanilla and whiskey until combined. Chop the bacon into small pieces and put it in a bowl. Add the brown sugar and toss to coat the bacon. Line a cookie tray with foil or parchment paper. Put the bacon on the tray and cook for 10 minutes, using a spoon to stir the bacon after 5 minutes. When the sugar is boiling check one piece of bacon, if crispy the bacon is done. Remove from oven and let cool for 5 minutes before transferring the bacon to a piece of parchment paper to cool before using. UPDATE: Thank you to every one that entered! The winners have been notified by email! 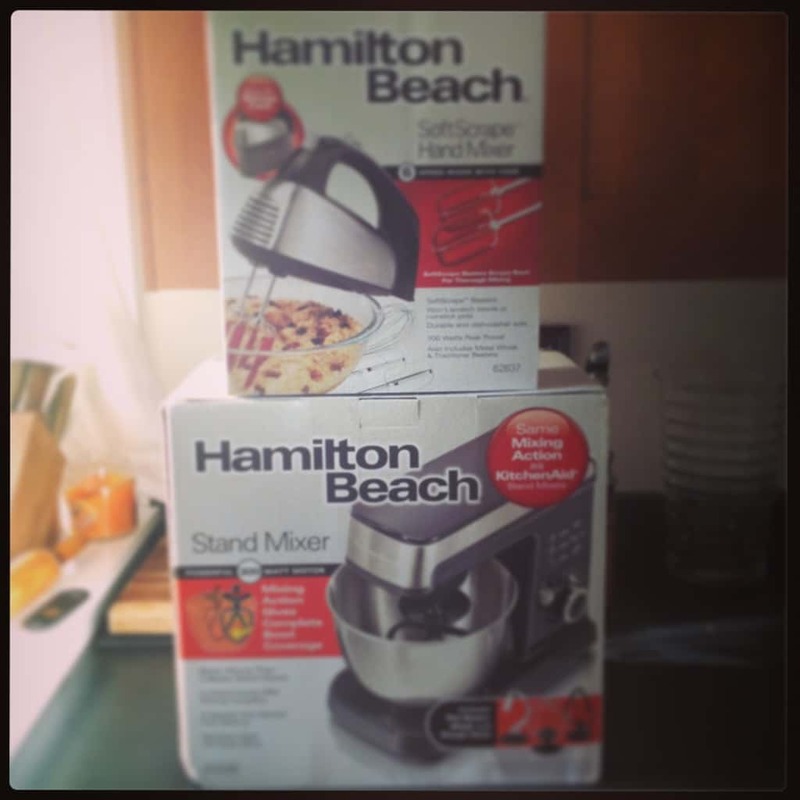 Hamilton Beach is so awesome that they are also giving away mixers to two of my readers. The first winner will win the The 6-Speed Stand Mixer and the second winner will win the 6-Speed Soft Scrape hand mixer. I will be using Rafflecopter to facilitate the giveaway and pick the winners, so enter using the Rafflecopter widget below. This giveaway is open to US residents only. Sorry everyone else who comes by all of the time for my International giveaways – don’t worry because another international giveaway will be starting soon. Ends June 5th, 2014 at 11:59pm CST. 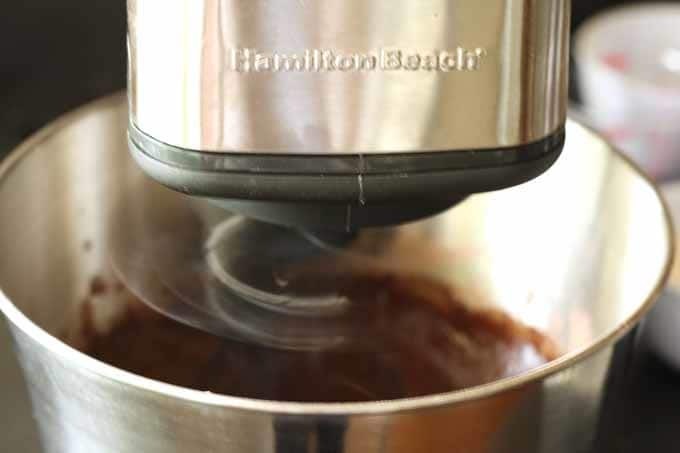 Disclosure: Hamilton Beach provided me with a 6-Speed Soft Scrape hand mixer and a 6-Speed Stand Mixer to review and are sponsoring the mixer giveaway. I would make some peanut butter cookies with dark chocolate chips! One of my favorites to make! I would make my delicious Carrot Cake! I’d make some sugar cookies to decorate. I would make dough, especially with the stand mixer. Kneading dough by hand is too time consuming and the results are always inconsistent. I would make German Chocolate cupcakes. I would make a ton of sweet treats! I would make peach cobbler or sugar cookies! This recipe sounds perfect for fathers…or even husbands who like whiskey!! I would also make some chocolate chip banana bread if I won. I would make my yellow cake with rich chocolate frosting. i would make some yummy cupcakes!!!! I would love to make pomegranate cupcakes and icing for my granddaughter’s birthday. I’d actually like to give this as a wedding gift if I win. Hello! The first thing I would make is a cheesecake. 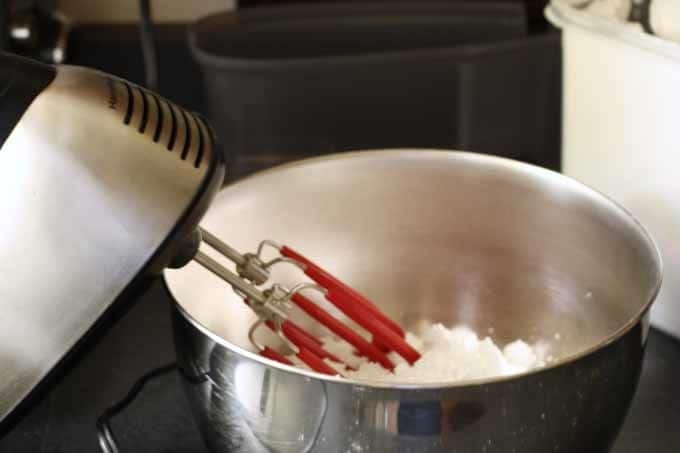 These mixers help so much to make the batter smooth & fluffy. Yummy! Thank-you! I’d make sugar cookies for decorating. I would use the mixer for homemade mashed potatoes and I’d make Red Velvet Cake with Cream Cheese Icing. I am going to make these amazing soft Chocolate chip cookies that I found in a magazine. I would make some sugar cookies if I won this! My kids love there sugar cookies! I would make a lemon cheesecake mousse. Probably a cheesecake with a gluten free crust. I’d make Dark Chocolate Brownies with the mixer. I would like to make my decorated Soft Sugar Cookies. I would make some red velvet cake with the mixer if I won. Sounds so delish! I love to bake! I’d love to make Domino Cookies , and Cinnamon Rolls with this mixer! Oh I would first make some homemade chocolate chip cookies! Dont have a mixer…so we always do the store bought ones! I would make Red Velvet cake if I won. Or maybe cornbread. I would make Bacardi Rum Cake! I am going to make Cinnamon Rolls! I would make some cake pops if I won this. I Love cake pops, very fun to make! I would make peanut butter blossoms! Oh I would love to make a chocolate cake from scratch! I would make my wedding cupcakes! I am going to make my Chocolate cupcakes. I would like to make some gooey delish chocolate brownies with this mixer if I won. I would make these cupcakes!!! Holy moly delicious looking. I would love to make blueberry muffins! I would try new recipies as well as some old and moldy ones like chocolate mousse, PB cookies, Italian Cream cupcake, red velvet, etc. Spitzbuben. Lots and lots of spitzbuben. I would make pound cake. I’d make some sugar cookies because I’ve been itching to do some cookie decorating. I would make a chocolate and peanut butter icebox cake. Thank you so much for offering such a wonderful giveaway. If I won I would also make some vanilla cupcakes with cream cheese frosting w/sprinkles on top. I would love to make some lemon poppyseed muffins for my son! His favorite! I would make Harvey Wallbanger cake! I will make my Whole Wheat Bread recipe. i would go on a baking spree and make cupcakes, banana nut muffins and cookies. I would make pound cake or cookies if I won this awesome mixer. Thanks! I would make some pumpkin bread with these mixers if I won. My kids love this bread, one of there favorites. Oh I would love to make banana bread! One of our families favorites! i would make oatmeal chocolate chip cookies and make them vegan. These cupcakes look so delicious!! !